Greg says: We've reached the point where you could shout out random historical eras and chances are Ubisoft has already considered making an Assassin's Creed set during that time. The Golden Age of Pirates is probably the best of those choices, and the team did an amazing job of recreating the Caribbean Sea as an open "ocean" experience. You can track and sink any ship you encounter with easy-to-learn and yet challenging naval combat mechanics, as well as jump off your pirate ship to swim ashore on any island to find collectible items. Add that to refined action-stealth gameplay, and a rousing soundtrack of sea shanties (which are also a collectible) and you've got a recipe for hours of fun. Ubisoft thankfully has moved on from Desmond's story, and AC4 is better off with only brief forays into the modern world framing the adventures within the Animus. AC4 is a fun, deep game that you can play for a few hours or a few lifetimes. Josh says: Storytelling in games has come a long way since the text-based adventures and the likes of Zork. With realistic graphics, full voice over acting, and dedicated writers whose sole job is to craft a compelling narrative, gaming has never before had the tools at its disposal that it does right now to tell a genuinely impactful tale. Nothing showcases this fact more than The Last of Us. On its own, the opening scene is a heart wrenching introduction to Joel, the game's protagonist, giving the player sufficient insight to understand his motivation throughout the story. From the very beginning, The Last of Us sets the player up to not only play the game, but genuinely experience the drama as the adventure unfolds. You might not care much for Ellie when she's first introduced, but she grows on you quickly thanks to her all-too-real interactions with Joel, and their cooperative struggles through the zombie-infested wastelands of America. 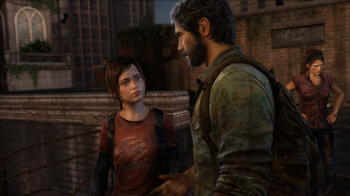 Given that it was all done with 8-year-old technology, Naughty Dog set the bar high for next-gen with The Last of Us. While none of the games currently available for the new consoles really aim to unseat The Last of Us as the benchmark for in-game stories, it's painfully obvious that they're going to need more than hyper realistic facial expressions (which are already visible in titles like Ryse: Son of Rome) to make players care this much about characters in a game.